As I have said, many times previously, I love slow tunes and ballads. Anything that is well written and plays off the emotions is right up my alley. Thus it was that a tune, recorded by Garth Brooks, hit the mark with me in 1989. 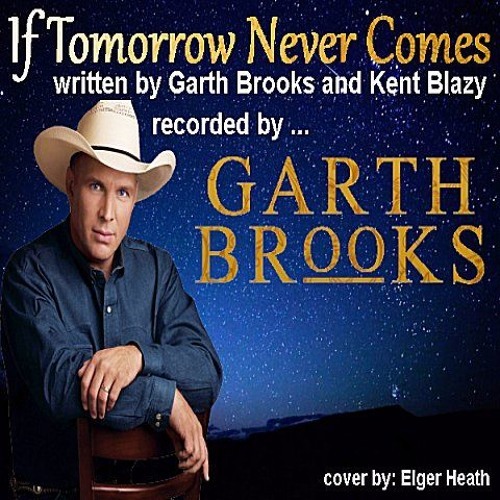 'If Tomorrow Never Comes', written by Garth and Kent Blazy, is a song about expressing your feelings to your partner and how important this can be. It has skillfully written lyrics and and beautiful piece of music to catch the ear and embed itself in the heart. Garth did an excellent job introducing this song to the world and it became his signature tune. This one-track cover is simple but I tried to capture the emotions of the tune and I hope that I succeeded. Here is my cover of 'If Tomorrow Never Comes'.